President Muhammadu Buhari was misled to approve $496 million for the procurement of 12 Super Tucano aircraft from the US without the backing of the national assembly, a source told TheCable. In August, the US government sold the aircraft to Nigeria to enable it combat the Boko Haram insurgency in the north-east. An embargo had been placed on Nigeria owing to allegations of gross human right abuses against the military. In a letter to the leadership of the national assembly dated April 13, 2018, the president explained that the United States had given Nigeria a deadline for payment, hence the reason he approved the money without consulting the legislators. Buhari also sought the inclusion of the procurement of the aircraft into the 2018 budget which the national assembly is still working on. The source said the lawmakers, particularly those in house of representatives, are not happy with the development, adding that the president cut short his UK trip in order to address the issue. In the statement issued to announce Buhari’s trip, the date of his return was not disclosed. “The approval for $496 million for Tucano aircraft is an impeachable offence. What is happening right now is that some people in the executive set Buhari up,” the source said. “They made him send a letter to the national assembly and the letter is saying that money has already been disbursed without seeking approval which is an impeachable offence. “This is part of the reason why the president came back into the country. He is thinking of calling the leadership of the national assembly for a meeting. Efforts to get a reaction from Garba Shehu, spokesman of the president, were not successful as calls to his phone did not go through and a text message was not replied. 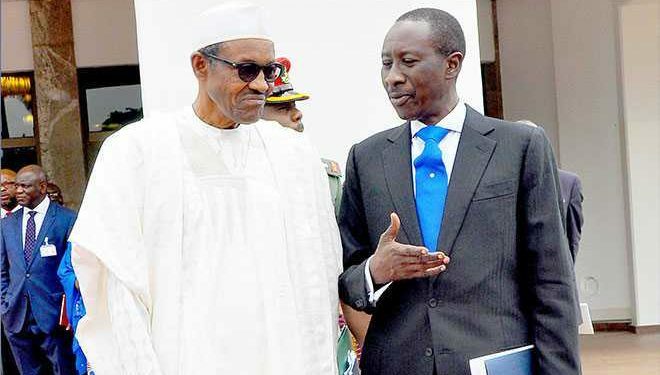 The presidential aide said Buhari had not approved the release of the money from the excess crude account as claimed by the minister, adding that the approval given to the federal government by the national economic council was undergoing the “normal legislative process” before the national assembly.